Paul du Plessis, Class Rep and Speaker at the December 1964 Gala Dinner at the 40-year Reunion of the Class of 1964 of the medical graduates from the University of Cape Town. These have been three stimulating, meaningful, memorable and even historic days. And we, the 54 or more of the class of 1964 who have gathered, are deeply indebted to the organising five - Ralph Kirsch, Ed Coetzee, Irwin Combrink, Fay Thornley and Joan Tuff. "These have been days to rekindle memories." "These have been days to gather fresh inspiration." "These have been days to renew friendships and even forge new ones." "These have been days of new learning." "These have been days of joy and laughter, of celebration and fun." "They have been days that have served to remind us what fortunate people we are." We have been remembering so many to whom we owe a great debt in these days. I've been thinking of the patients who allowed us to form a relationship of learning with them. How grateful I feel to them. How can we say thank you to them now? "I recall the first patient I was assigned to clerk in D1. She allowed me to feel the taut sclerodermatous skin over her knuckles; she told me of her increasing breathlessness; she mentioned difficulty with swallowing. "I recall a patient with a lung abscess in the same ward. Yes, I'd examined her clubbed fingers and listened to the bronchial breathing over the cavity, but it was the social history that took my attention. She shared with me details of her family life. Can I ever remember the shock when I walked into the ward and found her bed empty - she'd died of a massive haemoptysis. And so I could continue. Our gratitude to those who shared themselves with us in this way is great. We were fortunate to have studied in one of the most beautiful locations in the world, on the slopes of Devil's Peak, looking out on a Cape Town that in 1960 was being carved up by Solly Morris's road systems and Hendrik Verwoerd's apartheid. It was a Cape Town that has faced a succession of plagues - smallpox that was about to be eradicated, tuberculosis that was far from being under control. HIV had not yet arrived. These and many other threats to life and existence were the agenda for our learning. We were fortunate to have had such a marvellous faculty of teachers. We've recalled some of them again. Each of them left their mark. Can I ever forget Jannie Louw when I think of gastro-duodenal surgery and the importance of not eating oranges? Or that even a person like Prof Brock could develop late-onset asthma? They shared themselves with us as people. It was the same Eales to whom I'd gone when I'd seen blisters emerge on my hands. I was quite sure it was porphyria, and had already started to trace my ancestry to see which Dutch family was responsible for my disease. 'Where have you been this weekend,' was his question. I paused and told him about a walk along the contour path. 'O, it's the blister bush,' he remarked. Uys had his birds; WPU Jackson had his flowers; Doc Ramsay was a commentator - was it baseball or football? And there was D J Coetzee, the anatomy curator. He was also a writer. What was it he wrote? 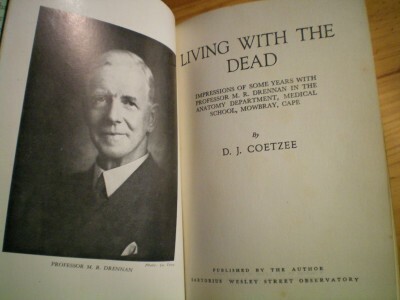 'Living with the Dead'? I suspect he'd need another title for the class of 2004 - maybe 'Living with Computers'. We had our visiting professors. There was Brink from Karl Bremmer who was probably glad to get back home after our children's Afrikaans for a day. But we were glad to have our man, Brock back. And there was the pathologist, Anderson from the US. He was author of a large text-book; we thought he'd be good, but once again we were glad to have our bushy-eyed Thompson back. The cartilage knife we gave him as a retirement gift was no indication of the respect we felt for him. There was more to our teachers than medicine; they concentrated on more than disease; there was more than one string to their bow; here were colourful personalities who helped shape our approach to illness and disease. In the midst of it all we were fortunate to have so much fun together, which is probably why we've wanted to get together for this reunion. Our paper darts suspended a physics lecture; we enjoyed the thrills of the PMH Flying Squad through the back streets of Woodstock for another of the 20 catches that had to be recorded, weight and all, just like a fisherman. Do you remember the amusement of arriving to see the new Obstetrics block named: St James's Palace? And a rubber glove blown up as a balloon at a PMH party? I see these days they go in for metal ones in the Health Sciences Faculty building! 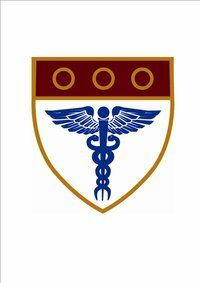 We listened to Hymie Gordon put the case against the new Medical School badge - 'It's Mercury's winged rod and not the serpent-entwined staff of Aesclepius,' he argued. He lost the debate, and as a result UCT medical graduates have proved themselves as good in communication skills as in the art of healing. There was Sax Appeal and Rag and Golda Selzer's Shawco. We learned so much through participation in the clinics. We filled paper packets with Aspirins in third year, diagnosed the common cold in fourth year and mitral valve disease in fifth. And we were trusted with managing clinic affairs. It was fun - good fun. We learned so much from it all. The early 1960s were sad days for South Africa as Dr Verwoerd withdrew us from the Commonwealth and relentlessly implemented pass laws and separate this and that and anything else he could think of. Apartheid laws were applied to our own class that most of knew nothing about until years later. We were fortunate that the 9% of the class who were people of colour accepted their place quietly and with a dignity we can and should recognise now. But foment was rising. Who of us will ever forget watching the silent march of tens of thousands of mainly black South Africans past the medical school. The name Mandela meant little to us. We had our noses to the grindstone. We were learning to be doctors. We didn't know what to make of Adrian Leftwich or the quietly-spoken and gentle physiotherapist whom some of us knew, who joined in attempts to register protest which led to their detention. Nor did we know what to think of Ray Hoffenberg who not only made the eyes of goldfish pop out in the laboratory, but drew the attention of the press and focused the eyes of the security police. We were fortunate. These people were stirring our consciences. It's a stirring that remains alive for many of us as we have committed to making South Africa and the world a better place. It was a sad day when we witnessed the lamp of academic freedom being extinguished at UCT. It took another 30 years for all of that to change. But we are fortunate to have been able to return to South Africa just celebrating ten years of democracy; to a Cape Town which has a new sense of freedom; to a university still changing minds and changing history; and to a medical school which not only has a new name, but a charter documenting commitments we can all endorse. How proud we are that two of the class of 1964 are among the signatories. Thank you Dudley, thank you, Ralph. We've been together for these few days and will soon scatter to continue what we've been doing. We've come together as the Koisan gather around the fire each morning in the cold Kalahari. They share their dreams of the night before. We've been sharing stories of the past 40 years! Their stories hold the Koisan together - our stories will hold us together. Like most of you I studied hard to grasp, understand and remember the many concepts we were taught. Generally I succeeded. I confess there is one subject I never found easy. I struggled with organic chemistry. I wasn't alone, for should our class not have received the Nobel Prize for Chemistry for inventing a new steroid nucleus with the number 41 attached! Three dimensional models did little to help when he spoke of rings rotating. How were these rings and particles held together? Then I heard about the double bond. Well that completely mystified me. In those days I was too shy to ask. But in these few days together I've caught a glimpse of understanding of the double bond - and I've seen it strengthened. "No it was not in the re-graduation, solemn and interesting though it was." "Nor was it in renewed friendships, important though these are." "It was in the double bond of the past and the future held together in one single moment." "It was in the double bond between the university and society which we embody." "It was in the double bond we share with colleagues on the one hand and patients on the other." "It was in the double bond between the creator and all of creation." Ralph, Ed, Irwin, Fay - your vision for this reunion - this opportunity to renew the double bond has become something beautiful for us, the class of 1964. And on their behalf I thank you.